Nine months of travel in the developing world will test your equipment to the limit. My gear list has changed quite a bit since I left, with some things being sent home and others being discarded along the way. About the only thing I’ve added is clothing I’ve purchased along the way — my pack is a good ten pounds lighter than when I left. 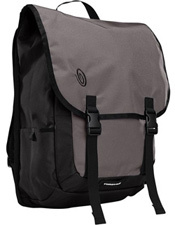 Timbuk2 Swig Laptop Backpack — I use this as my everyday backpack and it’s withstood every hazard I’ve thrown at it. It’s been rained on, crammed into taxi trunks and rickshaws, strapped to motorcycles and even pooped on by birds and monkeys, all while protecting my laptop, SLR, zoom lens and another five pounds of assorted gear. It sheds rain well and is in remarkably good shape despite being overloaded and seeing heavy use every day. The only complaints I have are that it lacks enough pockets inside and that it tends to fall over when you sit it down. iPhone — If I could only take one gadget with me while traveling, this would be it. I’m using a iPhone 3G which is over two years old now and has been unlocked so that I can use local SIM cards wherever I travel. I use it for reading books with Stanza, keeping up with email, reading the news, navigating my way around via the Maps app, tethering to my laptop for net access (when possible), calling home via Skype, updating Twitter and Facebook, tracking my website’s stats with AnalyticsPro, making notes and roughing out posts with Evernote, taking snapshots and occasionally even placing a local phone call. Keen’s Sandals — These things are bullet-proof. I’ve worn them every day for 9 months in just about every kind of terrain imaginable and they are still in perfect condition. While riding scooters or motorcycles, they safely covered my toes and made shifting easy and safe. Perfect footwear for Asia, where you find yourself removing your shoes often to enter homes or temples. Marmot Hydrogen Sleeping Bag — This bag saw absolutely no action while I was in Asia — there was just no reason to dig it out of my main pack. But now that I’m in India and it’s December, I am so very happy to have it. It only weighs 1.5 pounds and squishes down to the size of a cantaloupe with the aid of a compression sack, so I barely noticed it for all those months. I was reluctant to spend so much money on a bag, so I watched eBay where I eventually found last year’s model for $170. Silk Sleep Sack — I’d debated whether or not to bother with a sleeping sheet and am very glad I did. It weighs just a few ounces and stuffs into a built-in stuff sack about the size of my fist. Staying in budget hotels, I’ve found that sheets are often sketchy or sometimes even nonexistent — my sleeping sheet quickly worked its way to the top of my pack where it was readily accessible. REI wanted $45-50 for one of these but I found mine for $35. 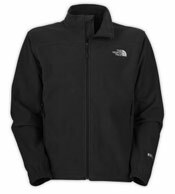 North Face Windwall Fleece Jacket — This is another item that saw little use in Asia, other than as a pillow. Now that the temperature has dropped, I’ve found it to be lightweight (2 pounds) and comfortable and it really does a good job of blocking out the wind. Layering my rain jacket over it gives me the warmth of a much heavier jacket without the bulk and weight. Found it on sale at REI for $80. Downside: doesn’t compress well and eats up a fair amount of pack space. 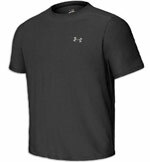 Under Armour T-Shirt — I wish I’d brought several of these. They breath well in hot weather and wick moisture from your body. Even more importantly, they dry quickly and are tough enough that you can wring out every last drop of water without wrinkling the shirt. I can wash it in the morning, wring it out, dry it in a towel and then wear it. Note: they’re sized to fit snug, so buy a size larger than normal if you want a loose fit. Marmot Precip Rain Jacket — An REI Outlet special, I bought this lightweight jacket for $60 or so. It weighs only one pound and has done a good job of keeping me dry during several downpours and while climbing around waterfalls. I wouldn’t expect it to perform too well in a long hike through torrential rain, but it strikes a good balance between usability and size/weight. Belkin Mini Surge Protector — For a geek like me, keeping all my gadgets charged is a real challenge on the road. Many budget rooms have only a single plug and the power itself can be a bit suspect, especially when visiting remote spots where electricity comes form a small diesel generator. The strip features three outlets and two USB plugs, and the plug itself rotates so you can squeeze the strip into almost any spot. With just one outlet, I can charge my laptop, camera battery, iPhone and USB-powered video camera all at once, while the built-in surge-protection gives me added peace of mind. Not bad for ten bucks. Booq Vyper Laptop Case — As a travel blogger and freelance graphics guy, protecting my laptop is at the top of my To Do list. The Vyper has taken a real beating and has saved my Macbook twice now, most recently from a half-liter of water that drenched the inside of my bag. The cover shed most of it and the water that did manage to leak inside was soaked up by the foam rubber padding. What’s your favorite piece of travel gear? Great list Johnny. We love our Belkin and iPhone as well. We will have to check out that backpack. Deb is looking for something new to carry her stuff in. I love my Tamarac computer/camera bag, so I am all set. Thanks for a great list. You look like us…your gear weighs more than your pack. Heh, travel and blogging/photography makes for heavy packs, doesn’t it? I need a full-time porter. You are definitely onto something with the silk sleep sheet / liner. I know I can’t live without it wherever I am travelling… South America, Europe, Asia, you name it. It surprisingly provided me with a much needed extra layer of warmth when backpacking around the Andes in Peru and Bolivia this year in the middle of winter. Who would have thought something so light would save me from losing my toes to the cold! Good point on the extra insulation! I’ve been amazed at what a difference such a thin bit of material makes. Great update on your gear mate and I’m glad to hear that giant rock you call a backpack is finally getting lighter than when you first left. I was just looking at REI’s website yesterday thinking about getting the Marmot Precip rainjacket – nice to see the recommendation for it! I’ve been really happy with it. If you happen to end up in Saigon, check the gear shops there — you can get a real $400 North Face Goretex jacket in some for as little as $35. I’m kicking myself that I didn’t grab one then (seemed to bulky to carry around unused). I can save you some more space! The REI Travel Sack works as both a super lightweight sleeping bag, sheet, blanket, and even a bathrobe! It’s rated at 55 degrees, so it’s warm, but not too warm. With clothes on I’ve used it camping in 40 degree weather. So glad I brought it with me. Ooh! Nice tip. Thanks, Matt! Very good list. The sleep sheet was one of our faves as well. Luckily for us, my mother-in-law made ours as a gift, and we got so much use out of them. And I’m going to look into that backpack as it looks like a good one. Great list! It really is the little things that make the difference, isn’t it? The sleep sheet and mini surge-protector were both big surprises for me. Gotta check out that computer backpack. Just out of curiosity… how heavy is that bag alone with your laptop and SLR lenses inside? A question about the Belkin adapter: Is it also a voltage converter? I had just bought one of these and read it wasn’t dual voltage. Should have read the product description a little closer. So do you carry a voltage converter with you as well? Yeah, I haven’t bothered with a converter either. The only things I plug in are my laptop and camera charger — both are dual-voltage. All the little bits charge off USB, so it’s pretty easy. Glad to know I can keep using my IPhone, How do you go about unlocking it. I used Blackrain to jailbreak mine, if I remember right. Things have become a lot more complicated — it depends on which model phone you have and what version of the OS you’re running. I’d just search “jailbreak [phone model] [OS version]” to find the right crack. Once you have the right crack, it’s a pretty simple process — took me 5 minutes. always love getting gear updates from people out traveling – so useful. also nice to see some of the things i’m preparing to buy: silk sleep sheet, belkin mini surge protector & fleece jacket – have come in handy and made your cut! Perfect timing as I’m just about to head off on the bike all over SE Asia for an extended period, would love to find some under armor gear here..
It’s good stuff. I wore it all the time in Asia and it’s still in good shape. I agree. Keen’s are like combat sandals and the treads last forever. Thanks for the laptop case tip, in particular. Like you, I’ve just returned to the world of the conventionally working, while travelling the world, and my MacBook is super, super-important to me. I’m going to bite the bullet and buy one. Don’t you find carrying a bunch of crap around is an amazing way to get fit? Thanks for this list. I’ve been struggling putting my RTW packing list together and your list has helped a lot. A surge protector is genius! One thing I’m curious about: why a silk sleep sack instead of a cotton one? Obviously silk is nicer… but cotton is cheaper! Also bed-bugs bite through cotton but can’t get through silk’s armor! Great list – I have the same rain jacket! I think sleep sheets are a god send mine has been used on night buses as they tend to just have leather seats that loves to stick to me! We’re planning on shedding stuff when we leave Chiang Mai – We bought far too much stuff! I’m a little late to this post. But I just wanted to add a word of warning about Keens. I threw mine away in the Khao Sok jungle because they are the worst possible footwear for leeches. Those little buggers can get right in there and then you can’t see them once they’re in. I loved my keens, but even barefoot was a better choice in the jungle. we just came back from South East Asia. We found our silk sleeping bags in Luang Prabang for abt. 20 USD. And you should get them also in other places in Laos or Thailand. You won’t get them for that price in Europe. Greta tip! Thanks, Ralf. They’re a lot of comfort in a tiny package — well worth it. Hey good for you, knowledge is power. I backpacked for 10 years throughout Asia and each year I had fewer and fewer items. If you keep going you’ll update this post with a less complicated picture. Go Canada. I can travel for weeks using a 40-45 litre bag. The first one I had was over 100! It was years ago. The more you travel the more you realise you can do without. Even little things like shaving cream are unnecessary. Shower gel does all washing (including clothes) and shaving. Out of curiosity…if you go swimming, what do you do with all your gear in your day bag? I ask because you said elsewhere that your binoculars were stolen from your room one day. This list really helped me prepare for my own backpacking adventure. Thanks so much for sharing this! Cool list; love the surge protector idea have to look into that and would not even think of travelling without the silk liner as it can also take the sleeping bag up by a season as it will be much warmer. Definitely agree with the sleeping bag liner. I picked a silk one up in Hoi An over a year ago for something like $7 and it has got a lot of use over the last year and is still in very good shape. Thanks for the tip on the sleeping sheet. I will look into that. I have foolishly brought my sleeping bag on several trips in tropical countries and regretted the weight. I brought one as well, but it only weighs 2 pounds. It was useless all through Asia but when I hit Northern India and Nepal in the Fall, I *really* appreciated it. One thing that I LOVE traveling with is a 10 Liter waterproof dry-bag. 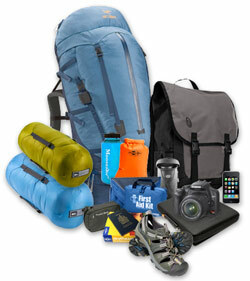 It is a good size if you just want to bring a few things with you on a day-trip, short hike or to the beach. It also doubles as a laundry bag, camera storage on wet days… Once you have one you will find a million different uses for it. I totally agree — picked one up in Laos and love it. Be sure to take your camera out of it as soon as you reach a dry spot — the humidity inside the bag can start corrosion very quickly. Dear Wes , have you a recommendation regarding how to disinfect plates and cutlery when you travel in small villages in far east . I use plain ol’ soap and water. I also carry a small bottle of hydrogen peroxide which should kill just about anything. REI sells very lightweight Lexan forks and spoons, which I once had but have lost :) I’ve eaten in a lot of small towns on the local plastic plates and cheap cutlery and have never had a problem, to be honest. If your concerned, the hydrogen peroxide would be easiest and most discrete — squirt a little on a bandana and wipe your fork down. Love Keen sandals. Not the most feminine but for keeping travel fun, any shoes that make your feet happy is worth not being a shoe maven.